Enhance has been installing brick pavers in Northeast Florida since 1997. The installation of brick paver patios, sidewalks, pool decks, driveways, and retaining walls is an easy way for any home owner to beautify and increase the value of their home at the same time. Choosing an installer is the most important decision you will make for your new paver project. We are confident that you will find our history of paver installation coupled with attention to detail to be one of a kind. If you are considering beginning any outdoor renovation contact us to schedule a free in home consultation. We look forward to working with you! A professionally installed brick paver driveway can give an elegant first impression of your home. Installing a beautiful brick paver driveway is the best way to create stunning curb appeal and enhance the true beauty of your home. 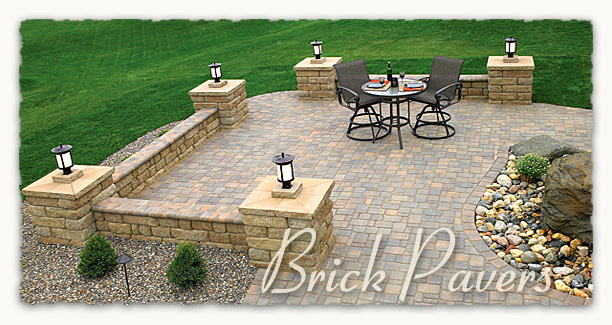 It is easy to keep your patio looking picture perfect simply by installing brick pavers. Other materials such as wood or concrete can require additional maintenance. Brick pavers provide a unique decorative look to your patio without the worry of cracking or discoloration. This affordable solution is ideal for the home owner who wants beauty and longterm durability of their outdoor patio. 1" brick paver tiles are an excellent solution for overlaying existing patios and pool decks that do not receive vehicle traffic. Overlaying 1" brick paver tiles over existing concrete can often be a cost effective solution to removing the concrete. Enhancing your new pool deck with brick pavers or remodeling your existing pool deck with 1" brick paver tiles can instantly change the look and feel of your pool deck. Brick pavers provide a low maintenance, long lasting solution. On new pool decks a full size coping paver is required. When remodeling your existing pool deck, a long remodel bullnose coping is recommended. All coping should should be installed with the highest quality grout and bonding agents. Adding a brick paver walkway to your front entranceway or back yard is a wonderful way to show case your house and landscaping. The natural color of brick creating a distinctive pathway is an inviting way to greet quests to your home and add interest to your outdoor appeal. We offer an expansive selection of paver colors and styles to ensure the effect your are looking for is achieved. Environmental paver products like permeable pavers and turfstone offer an effective solution to managing issues such as storm water runoff and erosion.